Given the recent developments in Zimbabwe and the African continent, it is worthy assessing how Chinese investments can affect the local economy going forward. Critical for Zimbabwe is how the country can turn its close Sino relationship into a mutually beneficial cooperation, not an exploitative one. The People's Republic of China (PRC) surpassed the United States in 2009 to become Africa's largest trading partner. The import and export value of China-Africa trade has grown from a mere US$10 billion in 2000 to over US$170 billion in 2017. China's exports to Africa reached $94.74 billion while imports from Africa reached US$75.26 billion, thus generating a trade surplus of $19.48 billion in a single year. China has extended more than $110 billion in commercial loans to African governments and state-owned entities (SOEs) between 2000 and 2017, at an average of about $6 billion a year. Chinese investment into Africa has grown by 40% every year from $1 billion in 2004 to over $68 billion as of 2016. A study by McKinsey in 2017 pointed out that there are over 10 000 Chinese firms operating on the African continent with a large portion of them engaged in manufacturing, retailing and mining. As a result, China has become the biggest creditor, investor and economic partner on the African continent at the expense of the United States and the European Union (EU). Trade between Zimbabwe and China has grown to over $1.2 billion annually with Zimbabwe exporting Tobacco, Cotton and various minerals. Imports from China mainly range from electrical goods, auto parts to various household merchandise. The most imposing Chinese investment in Zimbabwe has been the Long Chen Plaza built by Anhui Foreign Economic Construction Corporation (AFECC) for $200 million in 2013. Since the opening of the giant mall in Harare, Chinese retailers have occupied strategic positions in almost every town in Zimbabwe making them a force to reckon with in retailing. Other notable projects include the Golden Peacock Villa Hotel in Mutare built by Anjin Investments and National Defense College in Mazowe. In agriculture, the Chinese market is the largest consumer of Zimbabwe's flue cured tobacco with over $200 million worth of trade in the golden leaf in 2017. As a result, a number of Chinese firms are angling towards tobacco processing close to source in Harare. In addition to providing capital for farmers, the out grower scheme has guaranteed a ready market for Zimbabwean tobacco and ensured viability of the sector which now employs thousands of farmers. In the energy sector, China's Sino-hydro entered into a deal with the government in 2015 to expand the Kariba South power plant at a cost of US$533 million and the project was commissioned early this year. The expansion added 300MW to the national grid thereby partially reducing the national power deficit. In June this year, China's Import and Export Bank started releasing funds for the $1.4 billion expansion of Hwange Power Station by the same contractor. According to ZESA, the project is expected to take 42 months and add 600MW to the national grid. Further, the China Africa Sunlight Energy has expressed interest in the 600MW coal-fired power plant in Gwayi. Other projects of note include the 3 agreements signed between ZESA and CHINT Electrical of China to construct Solar Plants with a generating capacity of 300MW in partnership with Intratrek Zimbabwe. Whether these latest projects materialize or not, time will tell. However their implementation has potential to wipe out the country's power deficit and place Zimbabwe back on the energy self-sufficiency map. In transport and communication infrastructure, the Chinese funded the expansion of the Victoria Falls Airport in 2016 to the tune of $150 million, with China Jiangsu International Group being the contractor. In July this year, Zimbabwe signed another deal valued at $153 million for the expansion of the Robert Gabriel Mugabe International Airport with the same financiers and contractor. The dualisation of the Beitbridge-Harare-Chirundu highway was also awarded to the Chinese company AFECC, though the project has already hit a false start and its implementation hangs in the balance. State owned entities such as Netone and Telone have also received loans from China valued over $400 million which have been integral in telecommunications network expansion locally, thereby improving internet connectivity. The completed projects funded by the Chinese have demonstrated that the Zimbabwean economy can benefit from Chinese deals as long as commercial contracts incorporate sufficient due diligence by parliament to ensure transparency. It is also key to channel loans where they are necessary and have monitoring systems in place to ensure the projects meet international standards. Angles that need serious tightening of screws include border control for anti-smuggling of minerals and externalization of sales proceeds to China though informal corridors. Additionally tax collection systems by ZIMRA need to be water tight to ensure compliance to local regulations by Chinese businesses. As with various recipients of Chinese loans and investments in Africa, reports of unfair labour practices, corruption, product dumping and counterfeiting, natural resource exploitation, tax evasion, externalization of foreign currency and fabrication of work permits for Chinese nationals have been reported in the local media. In 2014, Anjin Investments and Jinan were caught in a storm over allegations of Diamonds smuggling worth billions of dollars from Chiadzwa. In May this year, the Office of the President and Cabinet released a damning report of funds externalized illegally. Chinese nationals and companies featured prominently on that list with millions of dollars salted away from the local economy illegally. No action was taken on these individuals by the local authorities. Despite negative perceptions that economic ties between the two countries disproportionately benefit China and the general view among Zimbabweans that the Chinese workmanship is shoddy. Chinese Investments can be used to grow the local economy and create employment as demonstrated in Tobacco farming where Zimbabwe eclipsed the 237.1 million kgs record output this year with the Chinese as key partners. Chinese multinational corporations such as Huawei, Yutong, BAIC, Lenovo, ZTE, CHINT Electrical and Hisense can partner local firms and bring technological development to local suppliers or customers. 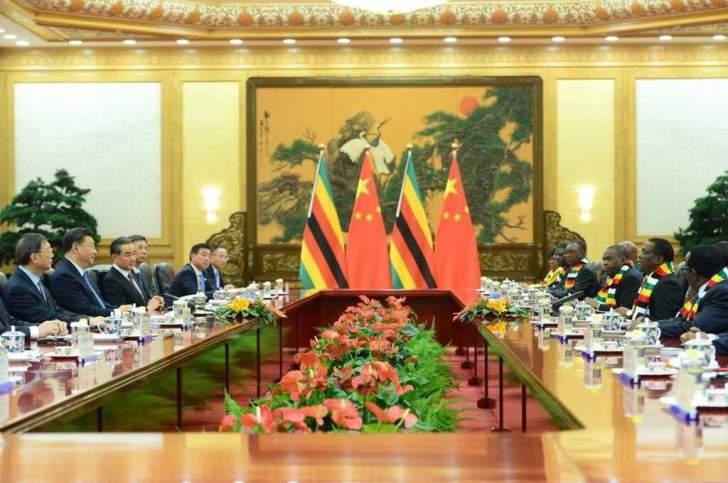 However without a clear strategy, Chinese investments may bring negative implications of geopolitical influence and unwarranted foreign debt to Zimbabwe as it has done in other parts of Africa such as Zambia, Djibouti and Kenya. By and large, Zimbabwe needs foreign direct investment (FDI) and economic development after years of negative economic growth and international marginalization. It is impossible ignore the reality on the ground and cherry pick who invests in the country or the conditions preferred on that investment. Like Ethiopia, Tanzania and South Africa, the government simply needs to ensure that it has a clear strategy that ensures Sino economic agreements benefit the country in the long term. Above all debt should be directed to projects that are self-sustaining or are of economic interest. The Chinese, (like any foreign investor who comes to Zimbabwe) can take advantage of any loophole in the local economy or governance system if the opportunity presents itself. For Zimbabwe to get the best from Chinese deals, it is the duty of the government and parliament to ensure that control measures that safeguard national interests such as local employment, fair labour practices, local industry protection, tax collection and debt repayment are strictly adhered to. Victor Bhoroma is business analyst with expertise in strategic marketing and business management aspects. He is a marketer by profession and holds an MBA from the University of Zimbabwe (UZ). For feedback, mail him on vbhoroma@gmail.com or Skype: victor.bhoroma1.